Kia ora Koutou, Haere Mai, welcome back to term 4 at Wainui School. 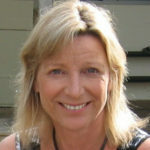 A special welcome back to Mrs Berghan who returns to school after having leave for a term. Mrs Berghan has a spring in her step and is pleased to be back with us all. We also welcome Noah Ouzoun (New Entrant) and his family who has started in Mrs Collins class. Positive Behaviour and Respect – This term we are all having a focus on our 5R – Respect and positive behaviour both in class and the playground. As all schools do we regularly revisit our behaviour policy’s and procedures to ensure we are being respectful of the boundaries to play-in (that is, not in the bush, the stream or past the yellow lines). That we are respectful of each other in our speaking (that is, not to swear or use put-downs), that we are respectful in our playing, being kind and inclusive and not to fight or be angry when games don’t go our way all the time. School is a place to learn to get along with others, be fair and have of course fun with our friends. If you need further clarification of what is happening in the class or in the playground, do discuss with your child and have a chat to the teacher or myself. Ag Day and Country Fair!! – This week much excitement is brewing for our annual Ag Day and Country Fair. On Friday the school programme is quite different as we all bring our animals and chickens for judging, our classrooms are transformed to show off for judging the arts and crafts and various creations. The programme is included in this newsletter, please remember to come along and have a look and support your child with their creations. There is a fabulous market, some games and lots of delicious food and coffee. We will have EFTPOS available for ‘cash out’ as well as to purchase ‘tickets’ for the games, sausage sizzle etc. You will however need money for the market stalls as they are not using the ticket system. Our FOWS group of parents headed by Kylie Allen and Nikki Browne for this event have done a wonderful job, please offer help, it is not too late!! Cake boxes have come home please help us by contributing in this way. See below for further information. See you all on the day we hope for fine weather!! Camp Year 7&8 at Sandspit – Congratulations Mr Irvine for turning a dissappointing situation around to ensure our annual camp for year 7&8 goes ahead. Next week all the year 7&8s and the parent helpers are off now to Sandspit Campground instead of the annual Motutapu Island trip. An excellent programme has been put together to include some challenge, some new experiences and of course lots of fun for everyone. Sunhats and sunsafe policy for term 4 means everyone must wear a hat when out in the sun. This will be in force from next Tuesday 24th October by all teachers. Sunscreeen will be available at school but we also encourage children to bring their own small bottle in their bag. Sensible clothing covered shoulders is advisable for summer play. It’s the crime of the century that’s too much to bear. Bear-boy-band singing sensation Baby Bear has been kidnapped! When a ransom note is discovered asking for an unlimited supply of ‘Just Right Porridge’ all hands and paws point straight at Goldilocks. 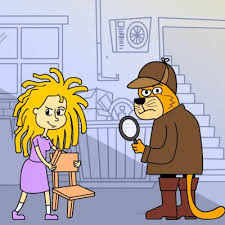 Facing a life sentence of uncomfortable beds, chairs and cold porridge she turns to the only cool-cat capable of cracking the case, the mysterious super-sleuth in boots known to all as the ‘Pet Detective’. Goldilocks discovers that sometimes when everything seems too hard, all you need is a friendly feline and a whole lot of perseverance to make it all just purrrrrrrrrfect. Young Farmer Competition Finals – Start at 1.30pm on the field for year 5-8 children. Watch as these contestants plant seedlings, label cuts of meat, fence in an animal and create an edible dessert – all whilst competing against the clock!!! 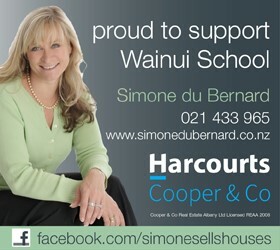 Thanks to Simone Du Bernard from Harcourts Cooper & Co for their sponsorship of our activity for the children who don’t have an animal – “The Harcourts Cooper & Co Paint and Plant”. This year, from 10.00 – 11.15am, these children will get a pot to decorate and plant up with seedlings. We ask that each child brings a $2 donation to help us cover the cost of the pots. DONATE items for the groceries raffle and encourage friends and family members to do so too! Please hand your donations into the office. Thank you so much to those of you who have already made a donation. Add your name to the PARENT ROSTER, contact fows@wainui.school.nz. Please volunteer at least one hour, but you’re absolutely welcome to volunteer more! A CAKE BOX has come home with this flyer. We would really appreciate everyone returning a cake box, one per family, (on either Thursday 19 October or the morning of Ag Day) with some home baking in it to sell on the day. Please note individually wrapped items sell really well! Remember to bring some spending MONEY along as there will be market stalls, food and drink stalls and games and raffles. EFTPOS will also be available on the day for ‘cash out” and to purchase ‘tickets’ for the activities. SUPPORT our sponsors! Many of the stalls will have advertising and promotional flyers from local businesses who have sponsored our Ag Day. We would love it if you supported them with your business like they have supported our school. These are some of our sponsors:Harcourts Cooper & Co – Simone du Bernard, Silver Fern Farms, The Canvas Company, SJB Honey, Pak n Save, RJP Drainage and Earthmoving, Pole Specs, Sam Mothersole Photography, Jovin Coffee, SKIDS Waitoki, Misty Ridge Miniature Horses, Countdown, Passionberry Café, Crawford’s Ultimate Solutions, Olliff Farm Eggs, Ibbees Honey and North Harbor Vehicles. Everybody is welcome, so please INVITE your friends, family and neighbours. Our Ag Day is a community event and we would love to see as many people there as possible! If you do bring a child under the age of 14 years old with you on the day, we have an obligation to have on RECORD the name of the child and the name of the adult responsible for them in case of an emergency. Note that an adult needs to be with that child at all times unless that child is currently enrolled at Wainui School. 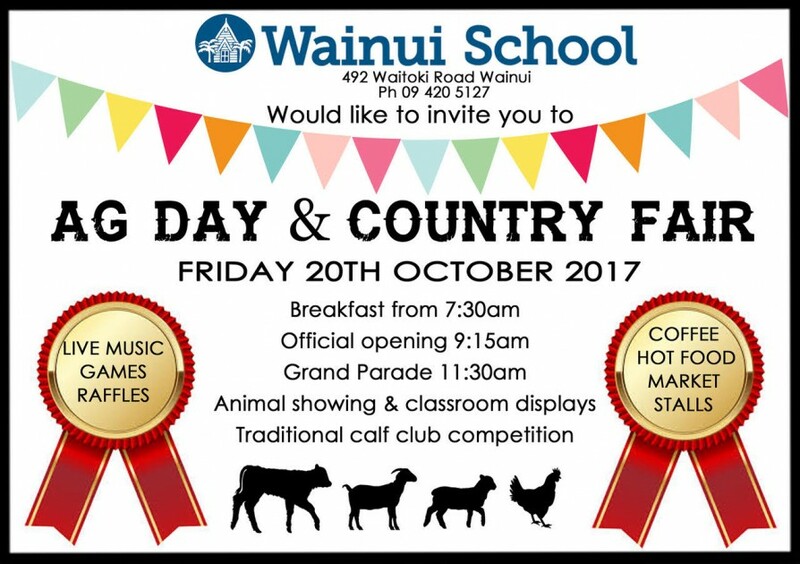 Friday 20th October – Ag Day. Monday 23rd October – Labour Day. Tuesday 24th to Friday 27th October – Yr7/8 Camp at Sandspit Motor Camp. Friday 27th October – Tui Team Assembly – 2pm.